That was the case for this particular family. Their rarely-used backyard pool was in need of repair. 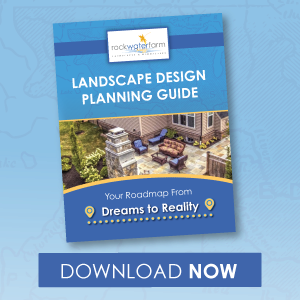 The family was looking for a brand-new landscape design for their Great Falls, VA home. It was time for a backyard retreat that could be used to the fullest for invaluable family time. A major objective for the family’s backyard was to make it more “user-friendly.” They wanted an outdoor space where they really desired to be—a space that called them to spend more time outside. These homeowners had children, and family time was important to them. But they also wanted a space that they would be able to enjoy for themselves for many years to come. The outdated space they had just couldn’t offer all of that. The homeowners were looking for a renovated pool along with a large patio where they could really spread out with family and friends. The family also wanted a fire pit located nearby. It was important that this area was close enough that those lounging by the fire pit still felt part of the fun going on in the pool. Privacy was also very important to the family. They wanted to be able to enjoy special family time but the neighbor’s yard was immediately adjacent to their pool area. The previous landscape design featured Leyland Cypress trees which had not only begun to decline in health but had begun to thin out and were no longer offering any privacy benefits. 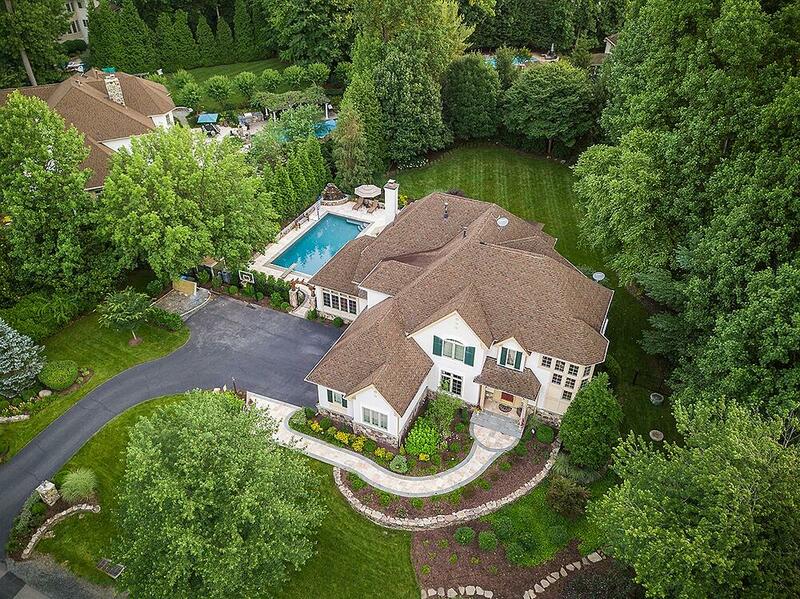 By installing Green Giant Arborvitae in place of the old trees, the family got instantaneous privacy. 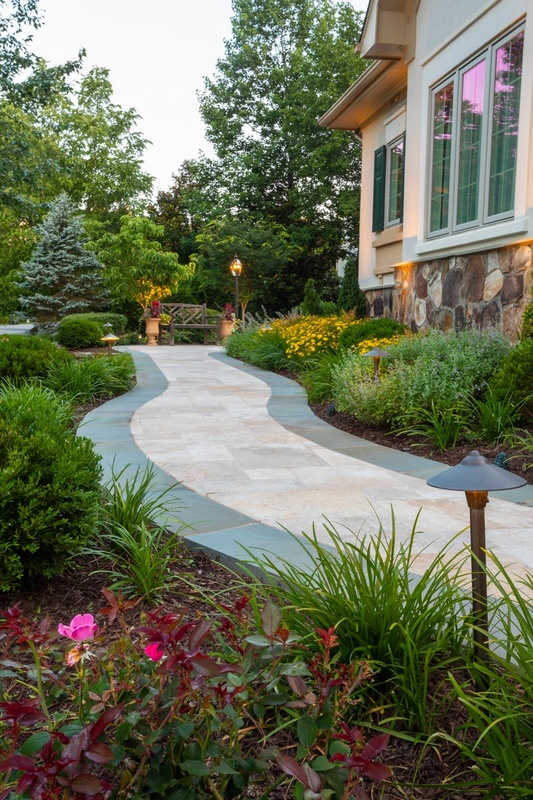 The choice of hardscaping material was ultimately just as important as the selection of plant material. 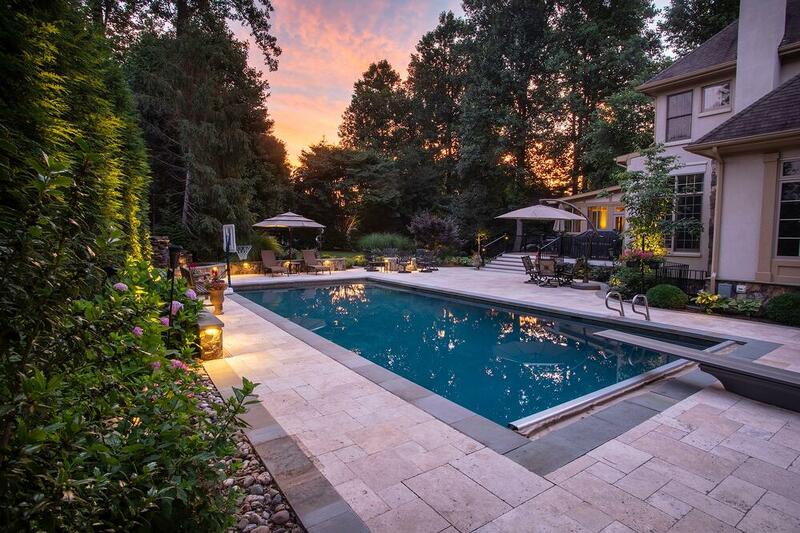 The design for the pool patio featured travertine, a natural stone that stays cool underfoot, making it a good choice for bare feet. It’s also a material that is slip resistant as well as highly durable. The beautiful travertine patio is also bordered by bluestone, for a truly unique look. In fact, this look was so appealing that the family chose to extend it all the way around their home and become part of the front yard landscape design, as well. 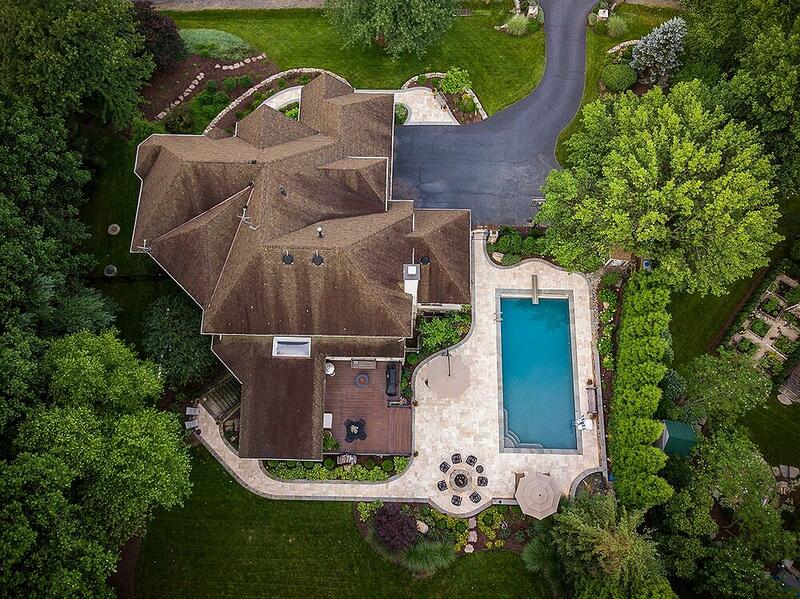 By having both spaces designed at the same time, it created a seamless flow..
From the aerial view, it’s easy to see how well the backyard and the front yard flow. The gorgeous travertine pavers from the pool patio ultimately flow into a walkway that circles to the front of the home. 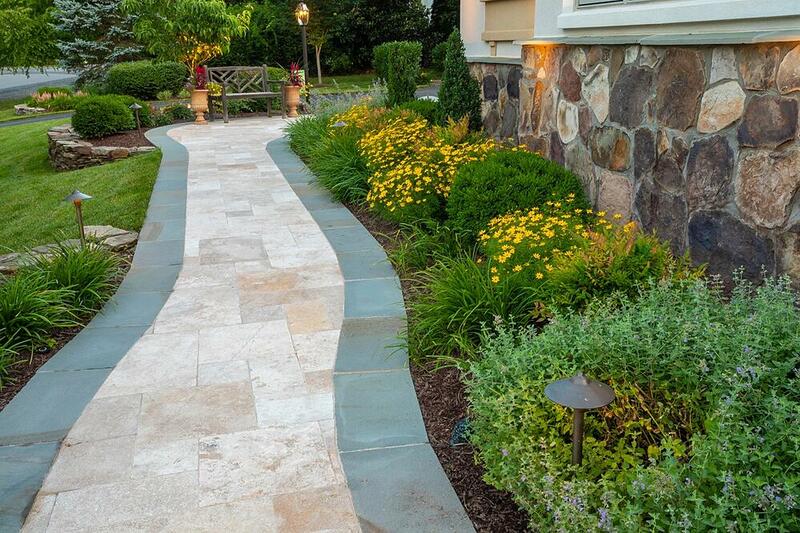 Even the front door walkway features this same landscape design—travertine bordered by gorgeous bluestone. Also of importance with the front walkway is that it was re-designed wide enough for two guests to walk to the front door, side-by-side. 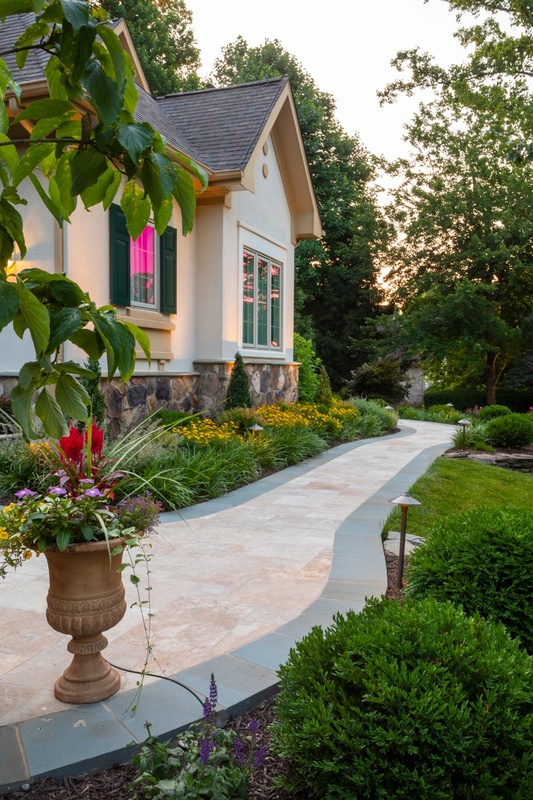 Front walkways are commonly designed too narrow so that guests have to file in one-by-one. This is awkward and uncomfortable. This wide, curving walkway not only now functions much better, but it also looks better, too. Another feature of the front walkway is what we call a “handshake area,” which is an extended area near the door. As guests are coming to your home (or leaving), there is almost always a time where they’re gathered near the door. But so often, a landscape design only features a tiny front stoop or an awkward landing area. With this design, we made the “handshake area” a large semi-circle where guests can comfortably gather to say “hello” or “goodbye” as they are coming or going from the home. It’s a better transition both visually and functionally. As a whole, the project also featured the addition of quite a few trees, shrubs, and perennials. The plant beds flanking the walkway and patio areas were designed with low-maintenance plants that added color and interest without adding a lot of extra work. Trees and shrubs were added to the back, front, and side yards for both privacy and aesthetic appeal. 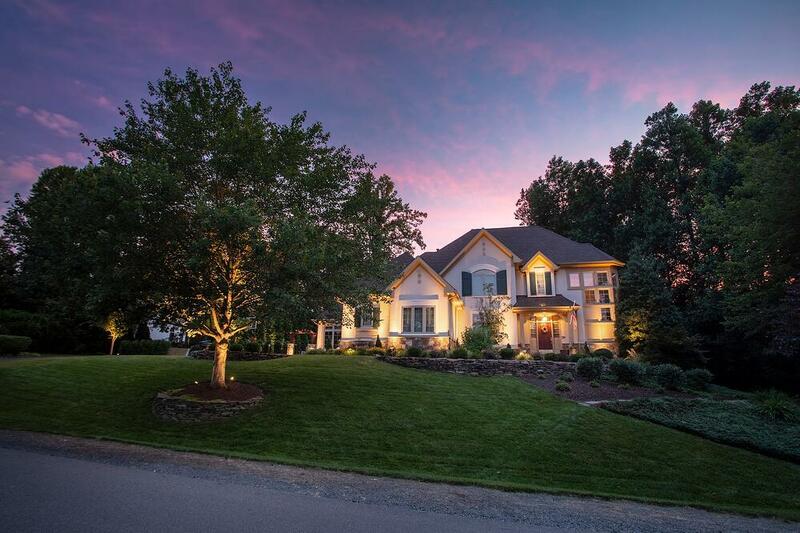 An additional and vital element of this landscape design in Great Falls, VA, was the use of landscape lighting, incorporated in both the front and backyards. 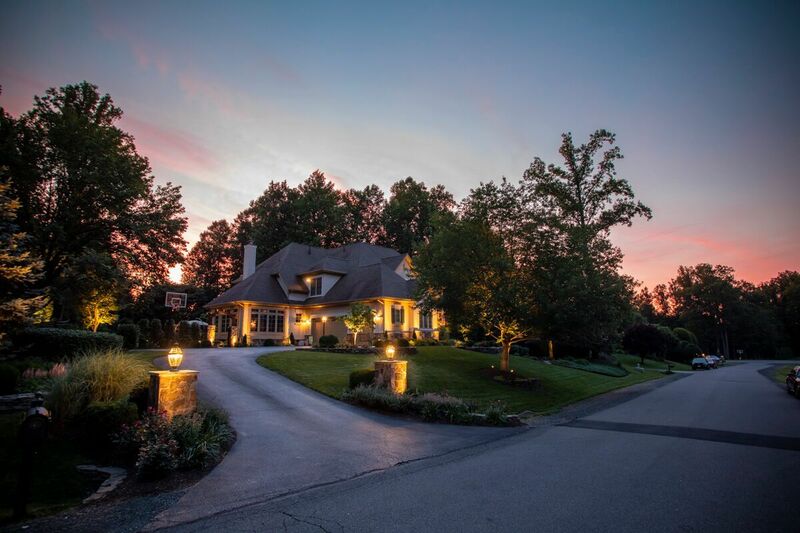 In the front yard, uplighting some of the architectural details of the home, as well as some of the property’s trees, adds curb appeal even after the sun has gone down. The added walkway lighting and front porch lighting also makes the space safer to traverse in those evening hours and also improves security with a well-lit property at night. 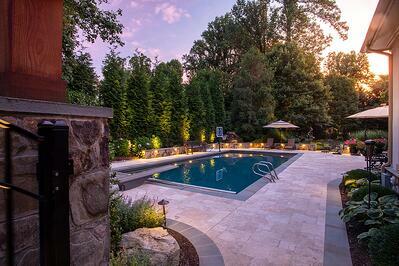 In the backyard, landscape lighting was also vital in order to make the space usable into the evening hours. It’s not like the family wanted to stop swimming or hanging out at their fire pit just because the sun went down. 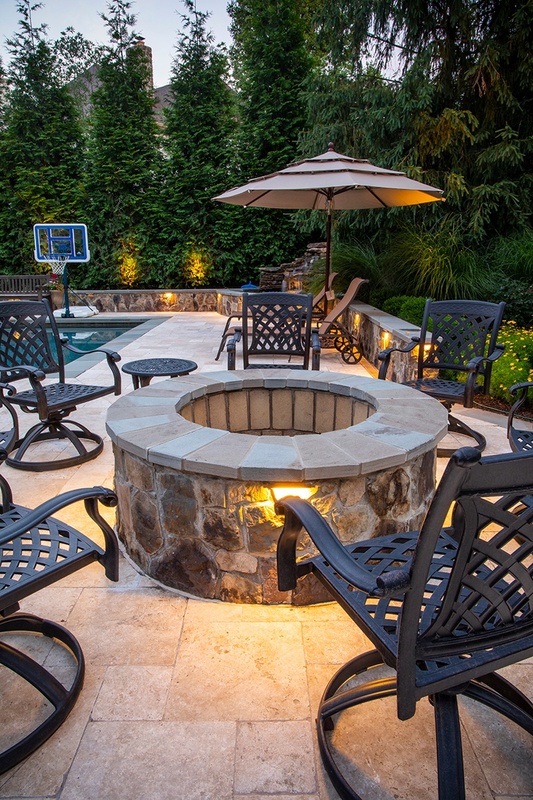 By incorporating landscape lighting into the backyard, the party can keep going on for hours. If you’re like this family and have a dysfunctional, outdated outdoor living space, then you may have some ideas for how you could make it better. 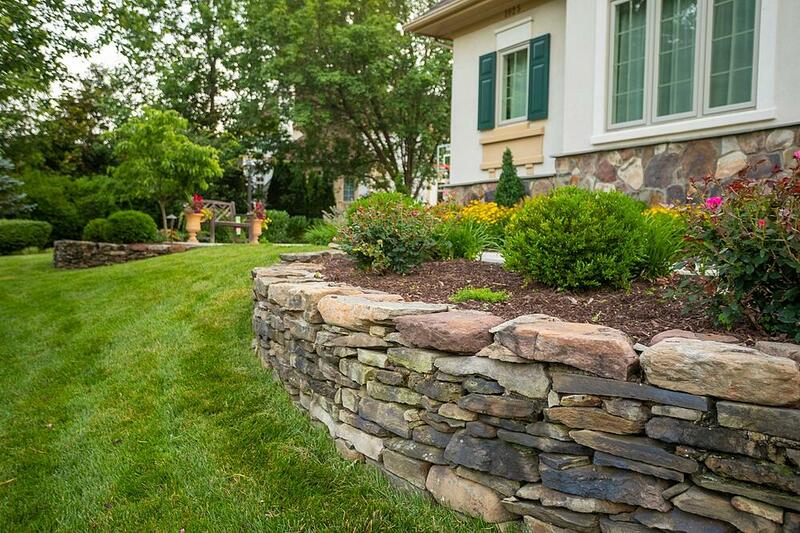 Of course, working with a landscaping company in the Great Falls, VA area that can bring your landscape design dreams to life will be key. Whether you already have an outdoor space that needs updating or you are starting from scratch, you want to be sure to choose a landscape contractor that has what it takes to make your space everything that you want it to be. Your decision means everything. It could make the difference between a space that beckons you to spend more time outside and one that you really don’t enjoy spending time in. By choosing wisely, you’ll be able to feel confident that you’ll get a space you truly love. We’d love to help you accomplish that. Are you ready to bring your ideas to life at your Great Falls, Ashburn, Aldie, or Leesburg, VA home? If so, then talk to an expert, choose a solution that rocks, and get ready to see your dream come to life.